1. The Strawtown-Koteewi Snow Tubing Hill opened to rave reviews last winter, and it was made possible through public/private partnerships. This new attraction drew 7,000 guests in its first season of operation. 2. 6,000 school children from public, private, and parochial schools across Hamilton County will have participated in a field trip at Cool Creek Nature Center or Strawtown-Koteewi Park, free of charge, by the end of 2018. 3. Preservation of hundreds of acres of prairie habitat provides critical habitat for Monarch butterflies as well as an amazing diversity of pollinators and birds. 4. The recently completed 19 acre lake at Strawtown-Koteewi Park will open in 2019, providing a relaxing venue for fishing and wildlife observation. Hamilton County is growing rapidly, with nearly 8,000 new residents in 2017. Our amazing parks, from Coxhall Gardens to the Monon Trail, are part of what attracts people to this area. We need to continue to ensure our parks remain vibrant and attractive and that new parks are identified and developed to match the needs of our growing population. Ideas for projects to improve our parks are identified faster than our local governments have the time or resources to bring them to reality. Only the philanthropic support of businesses and community members make it possible. Your donation to our annual sustaining campaign helps underwrite the costs of running the organization and allows us to focus on exciting new additions to your parks. 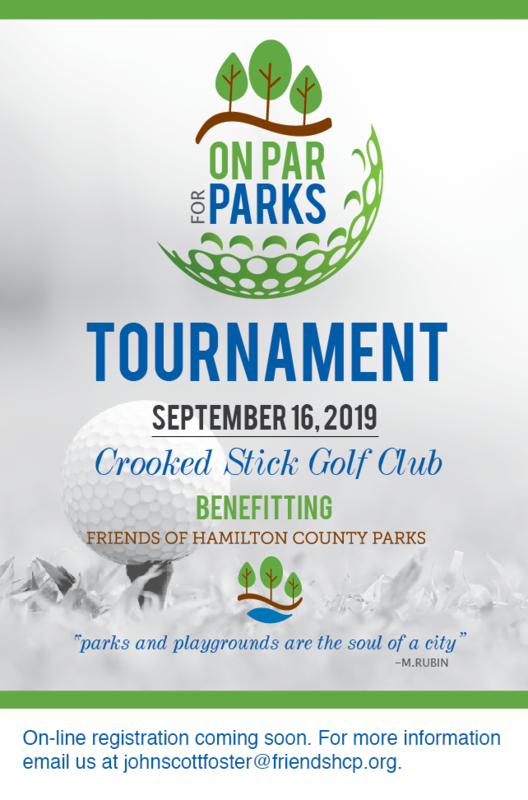 I encourage you to make a donation to the Friends of Hamilton County Parks. Click the “donate now” button below to contribute to the 2019 Annual Sustaining Campaign. P.S. Want to get together to talk about Parks, the Friends and our plans for the future? Contact me at 317.750.6198 or at johnscottfoster@friendsfh cp.org. Parks. A necessity, not a nicety.